Penn State has one Institutional Review Board to review human subject research (that meet the requirement for FULL review). The board has the expertise available to review both social science and biomedical research. The IRBs consist of faculty, staff, and community members appointed by the Associate Vice President for Research. The IRB must have at least one member serving on the board who is not employed or affiliated with the University or has an immediate family member employed or affiliated with the University. All IRB activities are coordinated through the Office for Research Protections (ORP) located at The 330 Building, Suite 205. 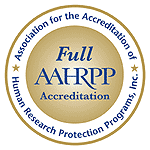 The Penn State Human Protections Program in the Office for Research Protections has been re-accredited by ‪‎AAHRPP‬, with no requests for changes or improvements. For more information please go to the Penn State News story. An Assurance is the documentation of institutional commitment to comply with Federal regulations and maintain adequate programs and procedures for the protection of human subjects. This is the principal mechanism for compliance oversight by the Office for Human Research Protections. Penn State has an approved FWA with the Department of Health & Human Services. This Assurance is for University Park and all campus locations with the exception of the College of Medicine located at the Hershey Medical Center. The College of Medicine has its own FWA. The expiration date for this assurance changes frequently. If you need the expiration date, please visit http://ohrp.cit.nih.gov/search/asurfnd.asp, enter the FWA Number above, and click "Search". The PSU IRB is registered with the Department of Health & Human Services.